Explore the power and magic of painting with Emmy® award winning David Dunlop! Join the team that created the PBS series Landscapes Through Time with David Dunlop for an informative and inspiring Painting Seas and Shorelines online and DVD workshop. Learn exciting old master and contemporary techniques in oil for creating dramatic sea and shoreline effects from acclaimed artist and teacher David Dunlop. His infectious enthusiasm and multi-disciplinary perspective combining art, history, philosophy, science and technique will provide a unique workshop experience for you. 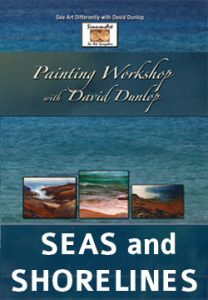 David gives several workshops around the countries of different elements of landscape painting and his Seas Workshops are enormously popular. These Painting Seasprograms are intended for landscape painters interested in learning new information and different techniques for painting seas and shorelines and expanding their painting skills and their background in art history. Using techniques of the old masters as well as contemporary methods, David Dunlop brings you a wealth of information, demonstrations, encouragement, tips, and insights in this 3.8-hour DVD. Learn new methods to dramatically improve your eye, your composition, your painting and your landscapes. David discusses several fundamental techniques and considerations of painting waves and the shore. He illustrates this discussion with examples from great masters and explores how they use color, movement and texture to create different aspects of the sea and shore. David paints a dynamic wave flowing along the beach in this studio demonstration in oil on aluminum. 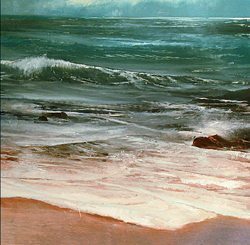 He begins with a brief discussion of different seascape paintings and then demonstrates different techniques, color mixing, brushstrokes and other tools for painting waves and the sea. 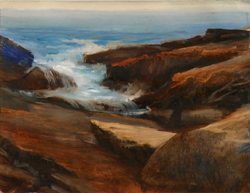 David travels to the rocky shores of Prouts Neck, Maine, where the famously enigmatic Winslow Homer (1836-1910) lived for the last 27 years of his life and painted some of his most recognizable, theatrical, and iconic seascapes. Battling the wind, David paints an evocative watercolor and an oil sketch at the location of the famed Cannon Rock, immortalized in Homer’s paintings. 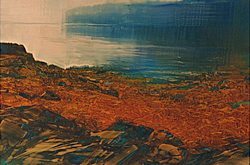 In his studio, David paints a study in oil of rocks and sea grass from a photo of a fog-drenched Massachusetts shoreline. He first discusses how he selects an image as the inspiration for a painting. He then explores the compositional considerations and how to retain an exciting tension when painting areas of great detail and activity and areas of calm and repose. He demonstrates different techniques using brushes and squeegees and explores their myriad effects.